Summer had just come to an end, but it sure didn't feel like it. It was sweltering in the lowlands and in the past I'd headed to the hills to get some relief. 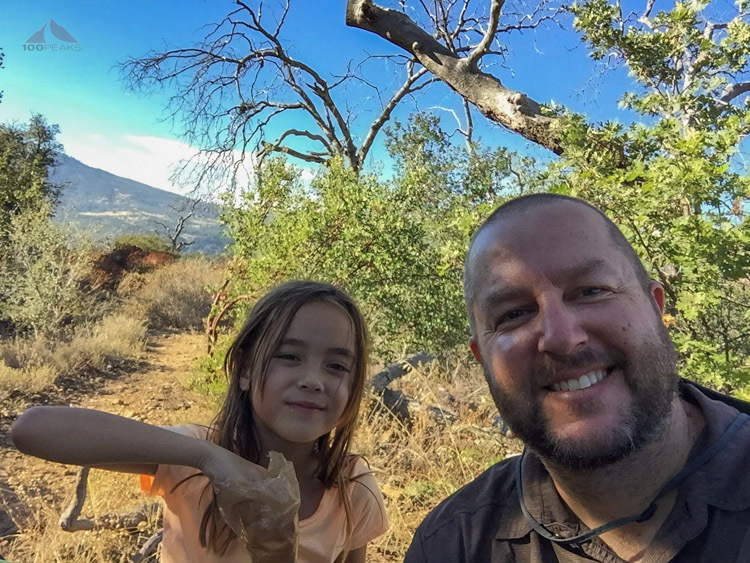 Since my daughter had a day off on Monday, we decided to go backpacking. 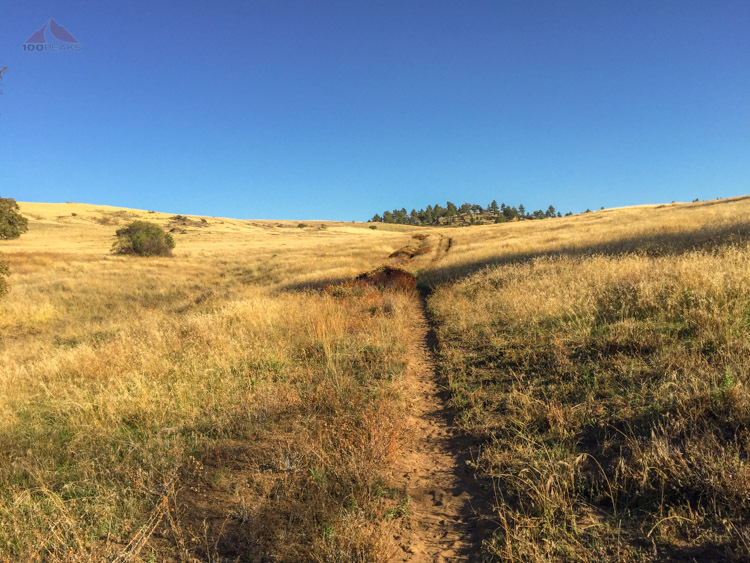 We had already backpacked to Arroyo Seco in Cuyamaca Rancho State Park, but had been curious about Granite Springs Trail Camp, which was a bit longer in mileage and more strenuous in elevation gain. Sophia was stronger than ever, so we packed our backpacks gave it a shot. It was also the night that the blood moon would rise from the east. Being in the Cuyamacas would grant us a great view of the show, which was a total eclipse of a super full moon. The redness of the eclipse moon gives it the 'blood' name and the closeness of the moon to the earth gives it 'super' status and guarantees a brighter and larger moon. I checked the weather and my app indicated that it would be 81F in Descanso, which is how I tend to gauge Cuyamaca's temperature. However, once we got to the Green Valley trailhead, it was a solid 92F. It was already about 3PM, so I stalled a little bit, chatting with the friendly rangers and walking around the day use area. I was hoping the weather would cool down a little bit, but I also wanted to make sure that we made it to Granite Springs before dark. We hit the trail and were immediately blasted with heat from the yellow dusty trail. We took our time, enjoying the shade where we could. It was a little steeper than I thought it would be, and Sophia was feeling the weight of her backpack. She had chosen to carry more on this trip, as she was acutely aware of the fact that I tend to cram my backpack so full of things for two people, that we often camp without a stove. This was the case this time, too. She was also carrying Sparky, the mascot for her classroom. The trail climbed and climbed before East Mesa came into view. It was still pretty far off, so we took frequent water breaks where we could find shade. We could start to see the familiar peaks of Cuyamaca in the distance. We stopped for a longer snack break on a log. As we scanned the emerging grasslands, an enormous turkey vulture silently soared above us to check us out. We finally made it to East Mesa and were treated with a view of rolling grasslands. We saw what we assumed were ravens, as well as some red tailed hawks looking for their afternoon meals. 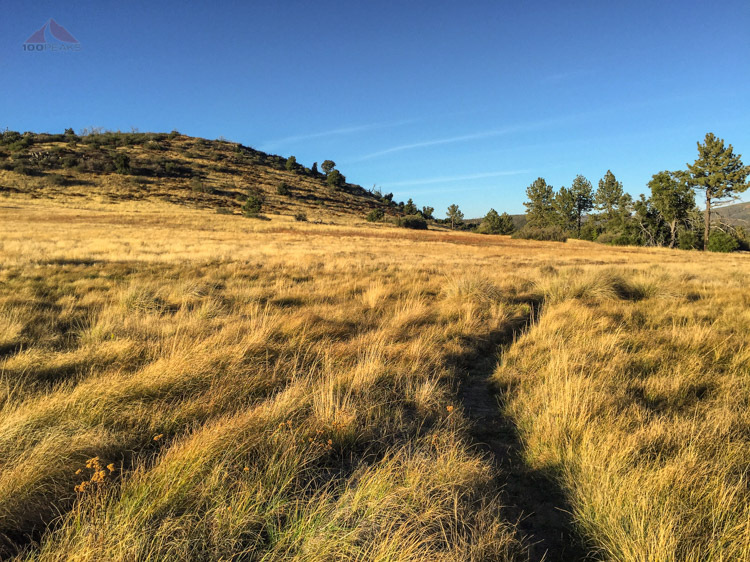 The trail guided us around a large hill and headed directly into the grasslands. We enjoyed watching all of the stink beetles, sensing our presence and sticking their rear ends high into the air. 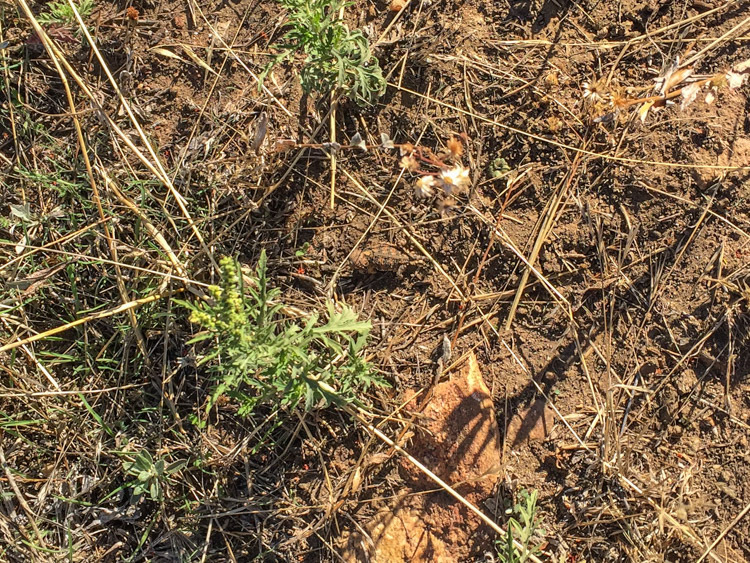 Occasionally, we'd see a flash of movement and spy a horned lizard sitting still in the grass, hoping we wouldn't see it. Once the East Mesa Highpoint came into view, we knew we were close to Granite Springs. The shadows were getting long and the heat wasn't quite as oppressive as before. Sophia was tiring out, so I grabbed her backpack and carried it over one shoulder for the rest of the way. I noticed some cowboy boot prints on the trail and wondered where they came from. Just before making it to camp, we came upon the owner of the boots. He was hiking with his horse and looking for water. I let him know I wasn't sure if there was any water around, since we brought our own. He saw some in the spring at Granite Springs, but wasn't happy with the quality. He was going to keep looking around and camp just outside the park, in Cleveland National Forest. We made it to camp and dropped our packs. We were delighted to see permanent pit toilets. We toured the campsites, settling on number one after noticing that number two didn't have logs to sit on and number three appeared to have a large colony of fire ants in it. In the failing light, we set up our tents and had our dinner. 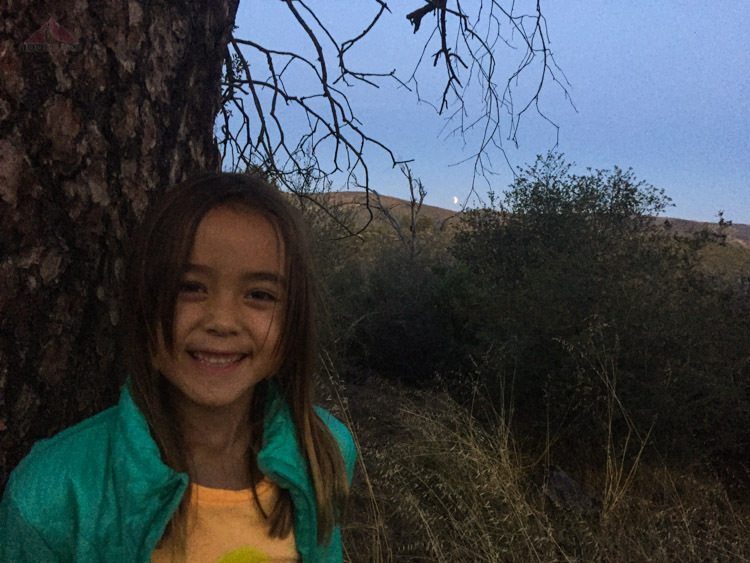 Once the sun went down, we walked to the eastern edge of the campsite and watched the moon rise over the Lagunas. I set up my GoPro and we chatted away, watching the stars and enjoying a mild night out. We had the campsite to ourselves and it was very quiet. Occasionally, we'd see headlights of a car driving across the canyon on Deer Park Road. We hung out in our tent, playing cards and enjoying each other's uninterrupted company. Before long, she was ready to sleep and I retrieved my camera and brought it back in, not knowing how the time lapse would turn out. It was like daylight, once the eclipse was over. No headlamps or flightlights were needed to walk around the campsite at night. As I woke up throughout the night, I had to check my phone to make sure that the light I saw wasn't the sun rising. It was just the full super moon illuminating the countryside. We woke up to what sounded like one dog barking. Then more joined it. Before we knew it, it sounded like over 100 turkeys clucking through the trees. It wasn't quite light yet, so we enjoyed the warmth of our bags until the sun was about to shine. We had some breakfast and packed our bags, enjoying the early fall morning sunlight. It was aiming to be another warm day, so we had to get going. I presented the situation to Sophia. 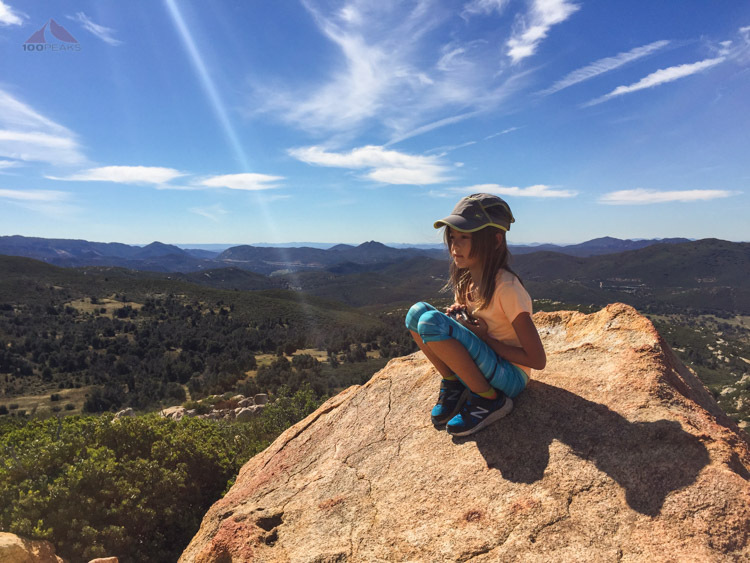 She originally had her eyes on summiting Oakzanita Peak, but, in light of the warm and challenging day before, I wanted to confirm that's what she still wanted. Today was going to be longer than the day before, but without as much gain. "Let's do Oakzanita Peak," she said. "I want to do it." We had plenty of water and daylight, so we headed out of Granite Springs and followed East Mesa Fire Road southwest. Before long, we encountered the cowboy's camp. His beautiful white horse was tethered under a tree while his tack, stove, and other supplies were laid out on a fallen log. The Pine Valley Creek drainage dropped off behind him. It was a great site, just over the border in Cleveland National Forest, outside of Cuyamaca Rancho State Park. We chatted a bit and then were on our way. East Mesa Fire Road rolled along as we chatted about what we saw and whatever came to mind. It's this type of trail time with my daughter that I cherish. We scan for wildlife. We inspect insects. We talk about everything under the sun. We get into a rhythm; the hiking takes no effort. Our minds flutter from thought to thought, unencumbered by distractions. We've had many heart-to-hearts this way, and I hope the words we share continue to evolve as my daughter matures. 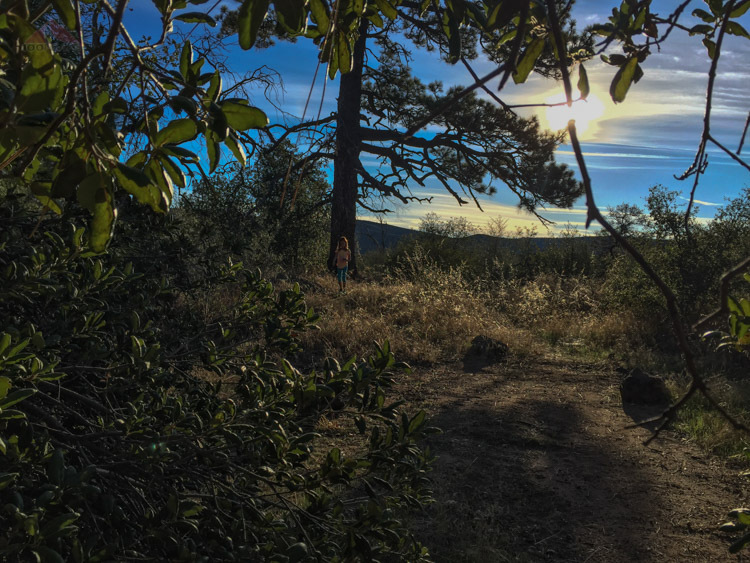 After passing where I left the road to summit Sugg Peak, we made it to the Oakzanita Peak Trail, which skirts along a meadow and leads up to the manzanita-covered base of the mountain. 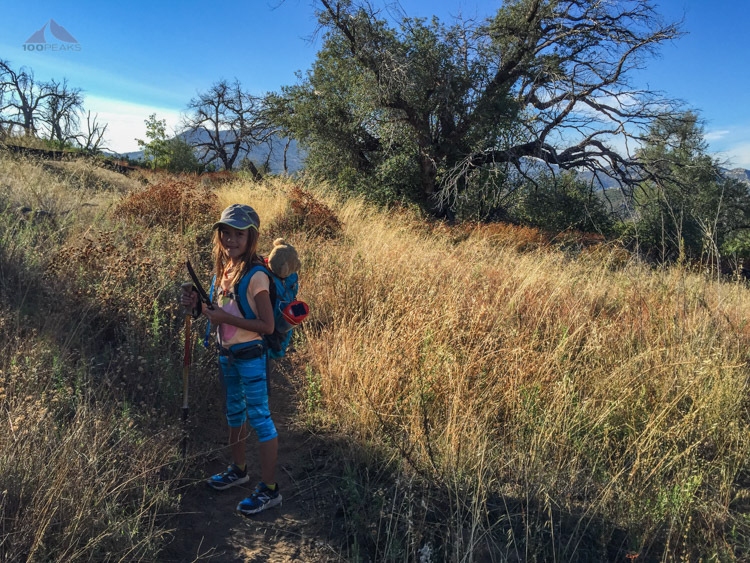 We stopped at the intersection of the Oakzanita Peak Trail and the Upper Descanso Creek Trail. I again gave Sophia a way out. Summiting Oakzanita Peak would add 1.2 miles and ~240' of gain and loss to the day. Sitting under the shade of a large sumac bush, with a mouth full of her snack, she firmly pointed the way up the mountain. OK, then. We hydrated and headed up the mountain. Unencumbered by our larger packs, we practically sprinted up the mountain. She was excited to be adding another peak to her list of peaks. She has learned to navigate rocky trails. She'll hike for hours without complaining. She has developed the patient mindset for hiking. She's never bored, as she's developed strategies to keep her entertained. She's always noticing something interesting along the trail and pointing it out to me, a skill I've passed on to her. She knows to stop and drink water frequently and when to eat when she's hungry. 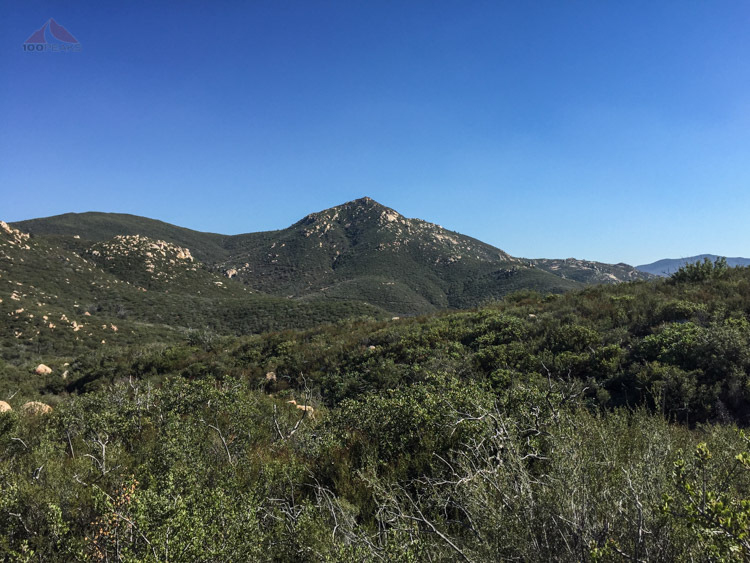 We reached the top and had an excellent view of Cuyamaca Peak and Japacha Peak, Middle Peak, Stonewall Peak, Sugg Peak, and East Mesa High Point. We could see where we camped at Arroyo Seco and the face of El Cajon Mountain. She was glowing with her sense of accomplishment. She took our her GoPro (an older hand-me-down) and took dozens of pictures. The pride on her face was evident as she scanned the distance we had covered in the last two days. I am sure it was evident on my face, too. 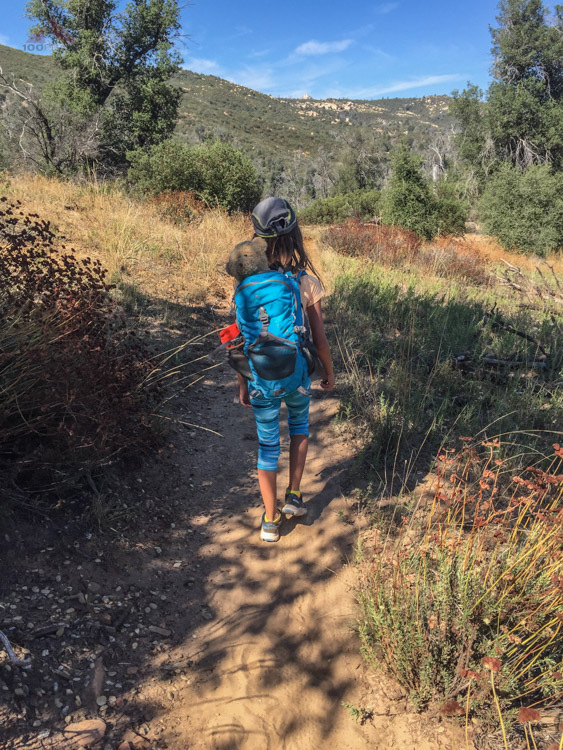 After a leisurely amount of time spent on top, we made it back down to our packs and found that she had rested her backpack on the nozzle of her bladder, emptying all of her water onto the shady dry soil. This is a mistake many of us have made, sometimes even in the backs of our cars. I had plenty of water, so it wasn't a dangerous mistake. I am glad she learned it. 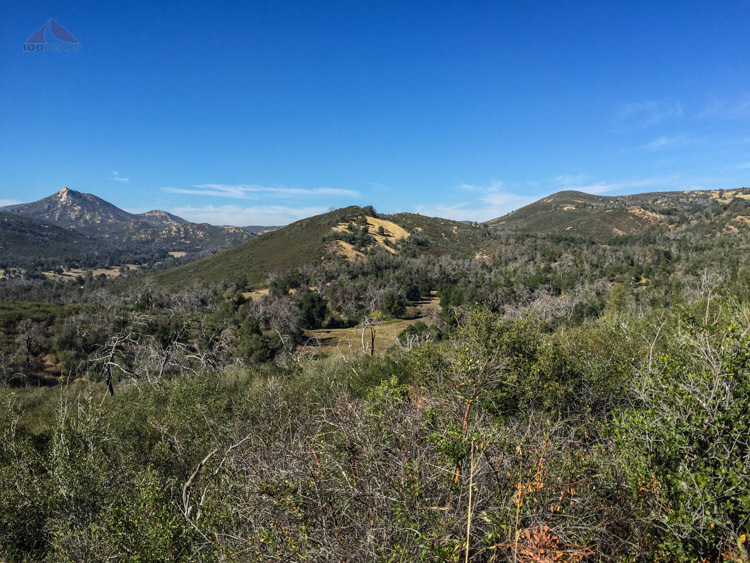 We started making our way down to Descanso Creek, which seemed to take forever, and then met up with the East Mesa Fire Road again. I could tell she was tired and hot, as was I, but we still had a ways to go on the East Side Trail before we would find our car at Green Valley. She grew quiet and all of my jests fell flat. The last 10 minutes were challenging for her, but I encouraged her to dig deep. We've all felt that last mile on the way back to the car and have learned how to deal with that discomfort, and she learned this day. We made it back to the car, started talking about lunch and our next hiking adventure, so all was well. In two days, we hiked 11 miles with a decent amount of gain in the heat. We had a great time watching the moon and sharing time with each other. I learned that my daughter is a very strong person. And so did she.